Srinagar, July 16: Indian Army on Monday morning gunned down an unidentified terrorist and foiled an infiltration bid after a fierce encounter that took place near Safawali Gali along the Line of Control (LoC) in north Kashmir's Kupwara district. 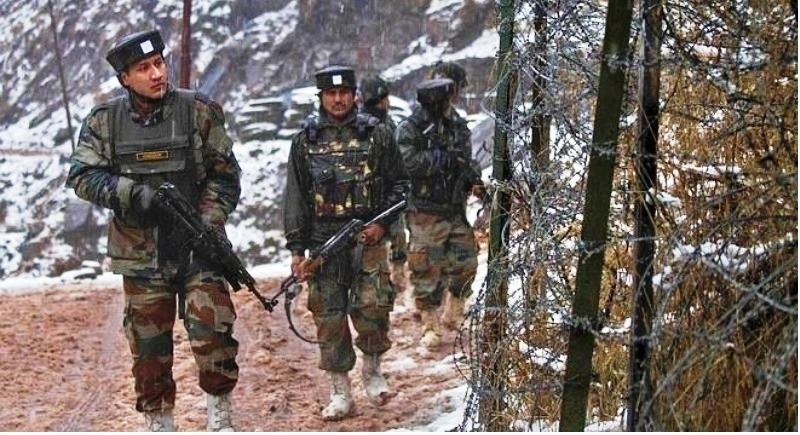 Notably, the alert team of Army including 10 JAKLI, 57 Rashtriya Rifles and 41 Rashtriya Rifles foiled an infiltration attempt in Safawali Gali along the Line of Control (LoC) in north Kashmir's Kupwara district and eliminated an unknown terrorist. After noticing suspicious movement along the LoC, the Army challenged a group of infiltrators but they opened fire which ensued in a fierce encounter. One unidentified terrorist was eliminated while two Army men were injured. The body of slain terrorist along with AK-47 rifle and bullets were recovered from the encounter spot. This comes days after at least two Central Reserve Police Force (CRPF) personnel were martyred and another was injured in a terrorist attack in south Kashmir's Anantnag district. On July 11, Indian Army killed one terrorist after a fierce encounter that took place at Kandi forest area in North Kashmir's Kupwara district. Importantly, the Indian security forces have led a massive war against terrorism and terrorists in the inner parts of Jammu-Kashmir and forward areas. Therefore, Anti-Terrorism operation is continued with such a speed that more than 206 terrorists were eliminated by Indian troops last year.